Howard Hughes’ Spruce Goose has found a home in the most unlikely of places in McMinnville, Oregon, housed in the Evergreen Aviation & Space Museum, having made its way from southern California. Originally built as a World War II transport aircraft, made entirely of wood, it retains the record of having the longest wingspan (almost 321ft) of any aircraft ever built. The Goose, technically labeled the Hughes H-4 Hercules, only made a single flight before being shelved but not forgotten. The museum itself, consisting of three separate buildings spread over several acres, including an IMAX theater, is impressive. When first entering the main building, I was awestruck by the sheer size of the Spruce Goose, hovering over all the other vintage aircraft like a gigantic mother craft. The space building has as its centerpiece a complete Titan II missile. It’s odd that there is such an impressive tribute to aviation and space technology in the middle of Oregon’s wine country, the Willamette Valley. Tasting Notes: The first time I ever ate at Nick’s Italian Café (Yelp: 4.5/5.0; TripAdvisor: 4.0/5.0) was when my daughter was checking out Linfield College to go to school. At the time, Nick’s was a semi-formal restaurant that had the reputation for serving and especially promoting the region’s great wines, pinot noirs in particular. The wine list was compiled in an intimidating notebook though the wait staff was very helpful. The restaurant seemed to be the only serious dining venue in what was then McMinnville’s small town atmosphere. What stuck in all our minds—me, my wife and two daughters—was the outstanding minestrone soup. More than that, it was the first time we’d ever had a dollop of pesto in minestrone, which we regarded as divine inspiration. Today, more than thirty years later, Nick’s still stands but has been taken over by Nick’s daughter and son-in-law. The menu has been updated, the interior modernized and the atmosphere thankfully more casual than before. It is also surrounded by a more robust commercial district with other quality restaurant options. 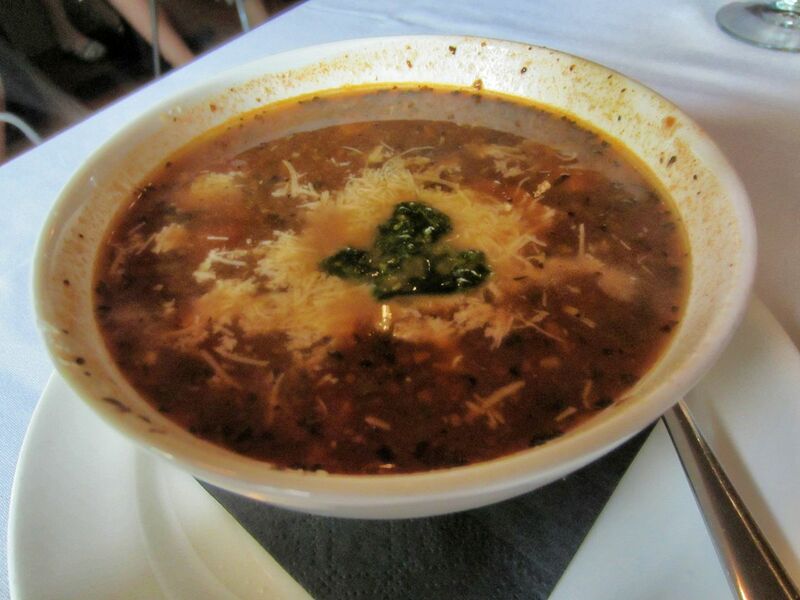 And, yes, the soup is still on the menu, listed as Classic Minestrone Soup (☆☆☆☆). While the entrées my wife and I ordered tonight was very good, the soup reigned supreme. I could eat a whole tureen of the stuff as dinner. This entry was posted in Oregon, Photography, travel, West Coast and tagged Evergreen Aviation & Space Museum, H-4 Hercules, Spruce Goose, Titan II. Bookmark the permalink.